Accurate measurement of radius is critical for high tolerance lens manufacturing but not usually so demanding for the primary mirror of amateur telescopes. Some methods in fact are rather crude such as the method of using feeler gages with a straight edge to measure the sag of a mirror. This method is quite suitable for a telescope maker who hasn’t yet built his telescope tube and doesn’t require a highly accurate focal length. On the other extreme optical systems often require tight tolerances in radius. These tolerances are usually expressed as two numbers for power and irregularity for the number of fringes (in green light normally) as measured against a test plate. For example 10/2 means a radius deviation showing no more than 10 fringes and the fringes must not deviate more than 2 fringes from a circle. These tolerances were sometimes as loose as 30 fringes in power or as tight as 5 fringes or even less of power. 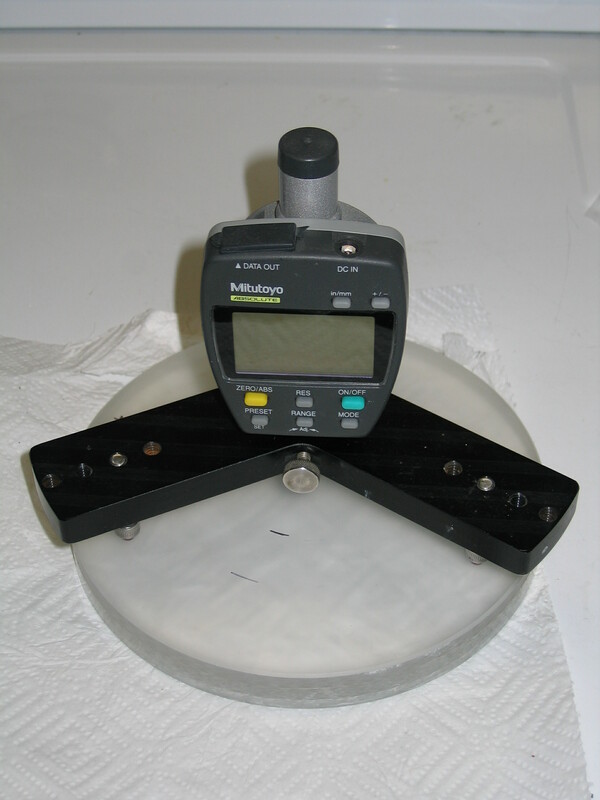 I have a commercially made spherometer with an accuracy of about .1% but I found it often wasn’t good enough. I will describe here the method I used to measure more accurately than with even this commercial spherometer. Most spherometers have three feet with either points, balls or bells (if you are measuring toroids then 2 feet). I don’t like points because they will scratch your lens if they are sharp. If they are rounded so that they don’t scratch then there is uncertainty about the radius of the point. Bells are much better. Mahr sells a line of spherometer bells which are precision ground hardened steel rings with a sharp edge on the inside and outside diameter. Like points they simplify the need for ball radius compensation. Besides being expensive the sharp edges don’t take much abuse and eventually lose their sharp edge or accuracy with use. I have used these and they are nice but are probably too expensive for most ATMs. Balls are much more affordable, I have 6 mm ruby balls on my spherometer and they won’t scratch a lens easily but cost about 11 dollars each from Edmunds (there’s probably a cheaper source… ball bearings will work and are cheaper but aren’t as wear resistant). I glue these with epoxy to a ¼-20 stainless steel machine bolt and trim the diameter on a lathe (not really necessary). The threaded shank allows me to raise or lower the balls for convex or concave curves. This bolt screws into an aluminum base and is secured with a nut after making all three balls the same distance from the base. Some have used pulleys as spherometer bases which is a neat idea. Use the most sensitive indicator you can find, but of course cost is a consideration here. I like an indicator with 1 inch of travel and 1 micron resolution but you may spend $400 to $600 for such a digital indicator. Dial indicators (analog) are less expensive and tend to have less range in the higher resolutions of .0001 inches. For telescope mirrors most amateurs won’t need the most expensive indicator but if you want to measure lenses to high precision then you’ll need a better indicator. Get the best you can afford. You can extend the range of your indicator by using gage blocks under each foot if needed. You need a reference flat to zero your spherometer indicator. You can make one yourself by lapping two glass blanks against each other until you don’t get any difference in the indicator reading measuring one to another. Be careful here though, it’s not difficult to have some residual asphericity in lapped parts. Some have suggested using the tool instead of a reference flat which will be OK for ordinary telescope mirrors but again you need to be careful of asphericity and note that the sag on a convex curve is different than on a concave curve using balls on the same feet radius. For steep radii on lenses the effect of grit thickness prohibits using the tool as a reference. Now we get to the crux of my method. The usual way of doing of using a spherometer is to measure the ball feet radius by measuring the separation between the three feet and using a trigonometric formula to solve for the ball feet radius. We need to know this radius as accurately as our sag measurements. This is no so easy to do accurately with high precision and you’ll need a range of micrometers as well to measure the different ball separations. Input the radius of the radius reference on line 2. Input the ball diameter on line 3 (in inches). Input the measured sag of this radius reference on line 6. Be sure to follow the sign convention of concave curves having negative (-) radius and negative sags, vice versa for convex curves. Otherwise you get a math error. This method depends on having an accurate reference radius. They are easy to come by in optical shops but an amateur can often find a chipped or not so good mirror at a swap meet to use for a reference. A short focal length is best to use. For the greatest accuracy the spherometer feet should be spaced as big as possible but you have to be careful not to exceed the measurement range of your indicator. I’m always changing the feet radius on my spherometer for small or large parts or for steep curves and find this method a lot more practical than measuring the feet radius with mics. The only thing you must do is to be sure the leg height the same.